A LaRue County mother agreed to serve 20 years in prison after pleading guilty Friday to charges she provided drugs to her 17-year-old son. He died last April from an apparent drug overdose. Arrest records showed Vicki Mayo, 51, was also on drugs the night her son, Cody Mayo, overdosed from a cocktail drug combination that included marijuana, cocaine, amphetamines, opiates and benzites. The state Election Fraud Hotline received 271 calls from 50 counties on Election Day, but none from LaRue County, according to Attorney General Jack Conway’s office. The number of calls to the hotline set a record. The previous high was 182. The majority of calls concerned procedural questions. Callers also registered complaints about election officials, electronic voting machines and electioneering within 300 feet of a polling place, according to Conway’s office. There were four complaints of vote buying, but none was substantiated. 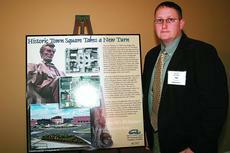 The designers of Hodgenville’s roundabout – also known as the “squircle” – received an Honor Award from the American Council of Engineering Companies of Kentucky in September. Firefighters fought limited water resources as they battled a Monday morning blaze that destroyed a farm house at 60 Grover Thompson Road, in the eastern corner of the county, near the Taylor and Green county lines. 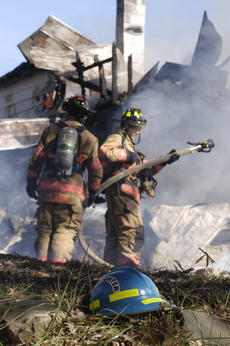 Dispatchers reported the fire was almost fully engulfed before firefighters reached the scene, sometime around 11:30 a.m. Continuing its tradition of excellence, the LaRue County Band of Hawks qualified for the finals Saturday at the State Marching Band Contest and finished fourth overall in Class AAA. 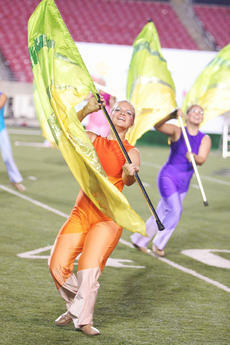 LaRue’s score of 85.05 earned the fourth-place spot in the field of 16 in state semifinal round early Saturday at Meade County High School to earn a chance to perform on the championship stage Saturday evening at Papa John’s Cardinal Stadium in Louisville. Hodgenville Elementary School Art Club students Logan Strange, Airyl Heath and Katie Roberts are going to be performing at the Hardin County Schools Performing Arts Center this weekend in the play Rumpelstiltskin. Fifteen students from the club went to the audition, where 180 children from area schools tried out for parts; only 60 students were chosen. The LaRue County Relay for Life kickoff is set for Saturday. The annual relay, organized by the American Cancer Society, is held in the spring. It allows people to pay tribute to those who have lost their battle with cancer, as well as honor cancer survivors and caregivers. At the community celebration, individuals and teams camp out, play games and take turns walking around a track, relay-style, to raise funds to fight cancer. Maintenance repairs will be made on northbound Interstate 65 beginning Wednesday between Exits 91 and 94 in Elizabethtown, the Department of Highways announced. Message boards will be in place advising the public of the change in traffic flow. Motorists are asked to take precautions in the work zone and can expect minimal delays. The actual starting date and duration of the work may be adjusted if inclement weather or other unforeseen delays occur. The Internal Revenue Service is looking for Kentucky taxpayers who are missing 2,740 economic stimulus checks totaling about $1.5 million and 873 regular refund checks totaling nearly $784,000 that were returned by the U.S. Postal Service due to mailing address errors. The average undelivered stimulus payment is $554 and the average undelivered refund is $898. In LaRue County, eight economic stimulus payments and one refund were undeliverable. The 21st annual Scouting for Food Drive is under way, said Scott Nutt, program chairman for the Frontier District of the Boy Scouts of America, which includes LaRue County. Some 2,400 Scouts and 7,000 adult volunteers, throughout the nine-county area will participate in this food drive. The Scouts canvassed local neighborhoods last Saturday and left door hangers or flyers requesting that residents place non-perishable food items on their doorsteps Saturday, Nov. 15.